Power Matching allows the user to increase / decrease the proportional power output curve to match the enclosures efficiency. By far the best thermostat out there , and the EXCELLANT customer service you get from Dion the owner makes this product just that much better !!! Im using one of these for an incubator, and im in love. Im definitely going to be purchasing a few more of these babies! without a doubt one id recommend to ANYONE looking for a GOOD thermostat! A leader's task so clearly, To find a path out of the dark"
Been using it for two years with no problems. By far the best thermostat i bought. i would recomend it for beginners and pros alike. This is the only thermostat I use. I bought three Helix thermostats and had nothing but problems. Switched to Herpstats and have worked perfectly from day 1. This is the first one i have purchased i got it for my incubator. Now my only problem, buying another to replace the Ranco running my racks. You can't compare the two. [SIGPIC][/SIGPIC]D. Thomas, The Python Lab. will by for all my racks, easy to use and dependable, great thermostat. 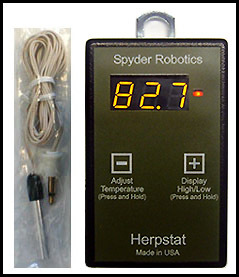 I use this thermo on my incubator and it works great. It is very easy to use. I use it on one of my racks and it stays perfect. I've had one for four years now that's been used for my corn snake's heat pad. I've never had any problems with it and it's kept the desired temp. within 2-3 tenths of a degree during the past four years. Highly recommended. Cons: I have not come accross any cons as of yet and hope not to! I have found this thermostat to be very reliable and easy to use. I was very surprised with it's functionality and affordable price. I will definitely recommend this product to my friends without any hesitations what-so-ever! I love these on my boa cages. User of 3 years now. I purchased this product, and the remote probe didnt work. Icalled the company, they sent a new probe fast, and it works great. Good customer service, walking me thru to set it up. Will buy another. After trying these , it's the only one I even think about using / purchasing. This is something very good product.